"I Want to Give It All"
(1980) "The One That You Love"
"The One That You Love" is a popular song written by Graham Russell and sung by Australian soft rock duo Air Supply from their sixth studio album of the same name. This song reached number one in the United States in 1981. It topped the Billboard Hot 100 chart on 25 July 1981 and remained there for one week, becoming the band's only number one hit. In Canada, it knocked the Stars on 45 medley off the top spot and stayed there for five weeks. "The One That You Love" also peaked at number two for five weeks on the Adult Contemporary chart, behind "I Don't Need You" by Kenny Rogers. It became an RIAA gold record. ^ Bronson, Fred (1992). The Billboard Book of Number One Hits - revised & enlarged. New York: Billboard Books. p. 545. ISBN 0-8230-8298-9. ^ "Forum – ARIA Charts: Special Occasion Charts – Top 100 End of Year AMR Charts – 1980s". Australian-charts.com. Hung Medien. Retrieved 23 December 2016. 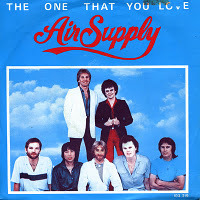 ^ "Air Supply Chart History (Canadian Hot 100)". Billboard.